Mei walked casually into the old galley of the Sword Palace. Many girls around her looked at the black-haired maid with curiosity. Her waist length hair and strong strength made the mysterious maid become a topic for the entire Sword Palace. After all, she was the legendary maid, whom it was said that the invincible Hua Huo said “No one can touch my Mei!”, besides, she was also one of the core people of the Starwing Knights. As an emerging organization, the Starwing Knights became the focus of everyone from the very first day of the new term. The Sword Palace never had an organization that had so many excellent girls. Even the weakest girl was at the 2nd rank, and the civilian girls and noble girls lived together in peace within this small organization. Although there were also a “civilian girls’ camp” and a “noble girls’ camp” in the small organization, the cohesiveness and power of the Starwing Knights were unprecedented. Rumor had it that even Hua Huo was also a member of the Starwing Knights. Regardless of Hua Huo, the two leaders, Hua Yue and Xiao Cao were also the most excellent students. Their teachers spoke highly of them and guaranteed that they had zero problems for entering the hero rank. Not only them, but all girls of the Starwing Knights also had that infinite potential. A dozen girls were thought to be able to enter the hero rank in the near future, and the remaining girls also had a 70% likelihood to enter the hero rank within a few years. 70%, what does that mean? The Starwing Knights had over 30 members, 70% meant that this small organization would have over 20 hero ranked members in the future, including super geniuses such as Hua Yue and Xiao Cao. Even in the entire Sword Palace, there were only a dozen hero ranked disciples now! No one would doubt that the Starwing Knights would have a bright future. Therefore, a lot of female swordsmen wanted to join the Starwing Knights, unfortunately, no one had succeeded up to now. Rumor had it that the requirement of the Starwing Knights was high, the only new member was Mumu, the little girl who often hid behind the twin witches. They even counted Mumu as part of it, the entire Starwing Knights had only 38 members. However, the girls who had submitted their applications to Hua Yue were ten times more than the first “38”! In fact, apart from the few female swordsmen from high-level sword domains, almost all female students in the Sword Palace had tried it. The Starwing Knights, which had only been formed for about 1 month, almost had the ability to dominate the White Lotus Sword Domain. And everything referred to an old tale of the Sky Sword God’s Domain. No one knew when and where the tale was derived, and the version was distinct in different ears, however, they had the same element, a black-haired girl who could bring good luck. She had a perfect face and skin, her long black hair contained mysterious magic. In the stories, the female swordsmen who were blessed by the black-haired girl could obtain the blessing of fate. The female swordsmen whose fates were blessed could obtain a brilliant life. Originally, it was just a tale. 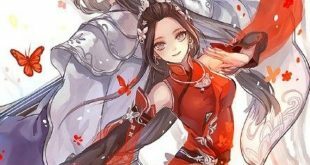 It was a small probability event that a female could be the number one in the entrance test of the Sword Palace, moreover, the female must have perfect black long hair, snow-white skin, and delicate face. However, the girls of the Starwing Knights proved that it wasn’t just a tale. Almost every girl heard about the same miracle from the girls of the Starwing Knights. They were just common female swordsmen whose sword talents were average, however, after obtaining the black-haired girl’s lucky charms, their understanding of sword skill suddenly advanced by leaps and bounds in one night. Not only that, even though they faced an unexpected disaster and were dropped onto a deserted island, they also didn’t face any danger. On the contrary, they obtained a great opportunity in the Water God’s world. After Casina the Battle God took them away from the Water God’s Fantasy Island, all of them awakened their special talents. They were really incredibly lucky! Moreover, their luck was still continuing. They just arrived at the Sword Palace and immediately obtained the blessing of the legendary White Lotus Secret Treasure. Do you still not believe it? There were also a lot of male swordsmen on the floating ship White Lotus, and they also entered the Water God’s world, however, 1/3 of them even gave up entering the Sword Palace and returned to the mortal world. Compared to them, the luck of the girls was incredible. No one still doubted the tale after knowing the experience of the girls of the Starwing Knights, everyone affirmed that they were the most lucky people. The starting point of everything pointed to one person. After investigating, the person’s identity was no longer a secret. And the secret of “her black hair can bring good luck!” was also no longer a secret. Mei (Star Thunder) looked at the girls around them in confusion. They were all gazing at her with longing. Especially when they gazed at her beautiful black long hair, Mei even felt as if their eyes were emitting bright green lights.